You’re most likely to find Nikki Millar in her home studio, face to face with some of the most well-known celebrities of our time. With her flat stacked wall to wall with hundreds of Disney bed sheets, Nikki hardly has any time for real-life people as she spends her days with Mickey and Minnie Mouse, Buzz Lightyear and the Teenage Mutant Ninja Turtles. 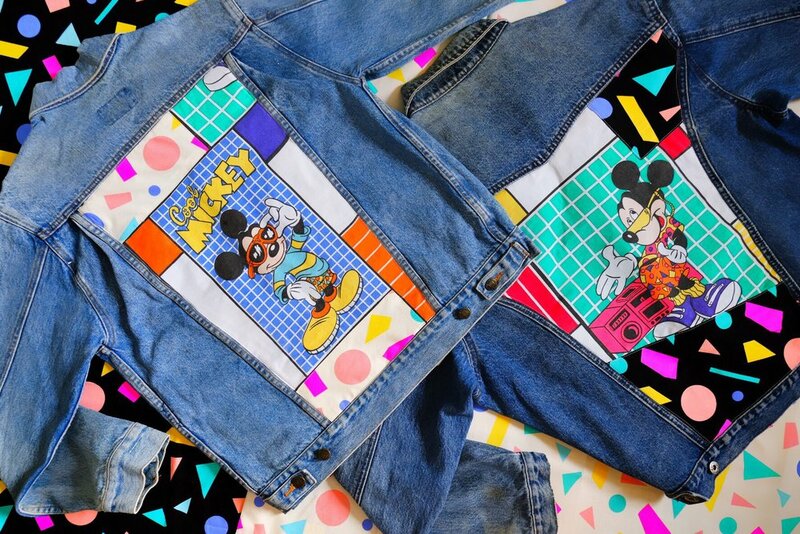 Her sharp sewing skills and childhood penchant for all things ’90s has manifested into career passion project, Silly Girl Club – a brand dedicated to upcycling nostalgic fabric to produce eco-friendly, affordable fashion. Nikki, the one-woman team behind the Leicester-based project, has been collecting long-forgotten fabrics of animated heroes since she was 14. Silly Girl Club has now grown into a fully-fledged business, producing dresses, bumbags, playsuits, patches and more, while maintaining an ethos to encourage recycling and ethical sourcing. How would you describe Silly Girl Club? Carefree, fun and nostalgic. And I think the recycling also has a big part. Well, I like to think so because it’s the part I’m most passionate about! How did it begin? I used to go to car boots all the time when I was younger. I love cartoons and whenever I saw fun bed sheets, I’d collect them. I had piles of them around my house. I started sewing in 2004 and making my own clothing because there was nothing I liked in the town that I lived in. And the bedding was just so bright and amazing. When did you start making stuff for other people? I hadn’t made or sewn anything for years after I left university because I absolutely hated studying fashion. But then my make-up bag broke and I made a replacement and put it on Instagram. People loved it! 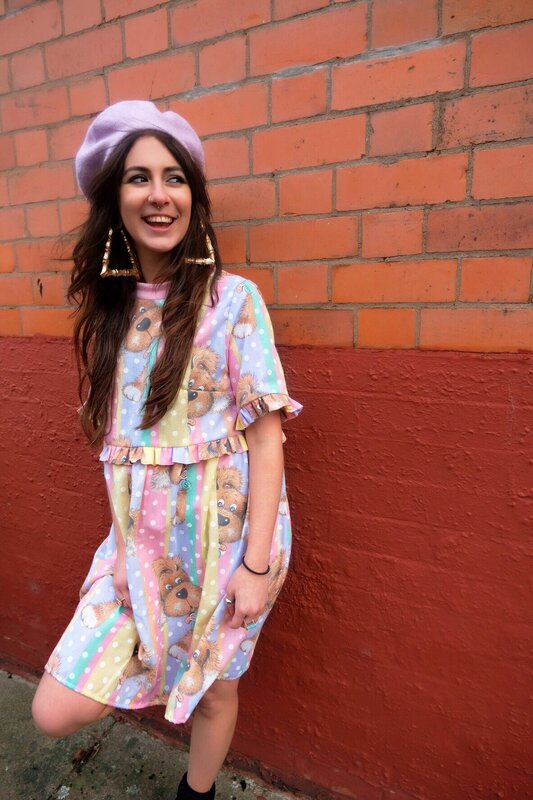 I put something on Depop and it sold within minutes – I couldn’t believe it. I made a few more bits and they sold again, and that’s when I figured there’s a demand for this. I kept making things alongside my full-time job as a hobby to get myself back into sewing again. I managed a bar for eight years but as Silly Girl Club developed a stronger online presence, I would end up working a 9am-6pm shift at the bar and then sew before work and afterwards – it was exhausting. I thought something’s got to give and I didn’t want it to be Silly Girl Club. What’s the deal with nostalgia, anyway? Nostalgia takes you back to a carefree time when you didn’t really have any worries, when you felt more free. It’s got that lovely feeling about it. This a major reason why I started Silly Girl Club – nostalgia makes people happy and I just feed off people’s excitement. Cartoons are fun! I love the colours and how anything can happen in a cartoon. It makes life less boring, doesn’t it? How do you source your fabrics? I’ve accumulated so much over time. I’ve been collecting fabrics for years so I used to have suitcases and boxes full. But now I’ve been getting through it really quickly. There’s a guy in America that goes thrift shopping for me, he is my absolute hero. Other than that, my favourite hobby is charity shopping and nowadays, followers send me stuff too. They’ll say “Oh, I had this in my cupboard and I don’t use it anymore, do you want it?” – it’s the nicest thing in the world. How does recycling and sustainability factor in? For me, I don’t really buy anything new from shops unless I really have to. I’ve always bought secondhand and it’s been a conscious decision for me because I don’t like waste. Recycling and knowing where something’s come from is a massive deal to me, I don’t think I could make clothing that I knew wasn’t recycled. There’s a quote from a BBC report that hit me hard – it said if clothing consumption continues as it is, by 2050, fast fashion will account for a quarter of our total impact on climate change. And ethically speaking, I always look at my clothing and the stitch lines and think, a human has made these. They’ve probably worked the same amount of time as me, maybe more, and they are most likely not getting a fair wage. I don’t think people often think about it. People are very enthusiastic about recycling but they don’t think of fast fashion in the same context. What does Silly Girl Club represent? I want it to be fun, but also conscious and inclusive. I try as much as possible to make things that are easily worn and affordable. When I first started SGC, a few people emailed me to say how much they appreciated no fastenings on the clothes. It’s important for everyone to feel included. Even monetarily, for people who are less able to afford things, I’ve started prices from as little as £2.50 so that anyone can be part of Silly Girl Club. What does running a small business mean to you? Honestly, it’s the best thing I’ve ever done. Every day I wake up super happy and I jump up into my sewing room straight away because it’s crazy, I’m doing what I love. It’s given me some confidence I never thought I had, which is amazing.